John de Lancie's Trek character "Q" was named for a British fan, Nancy Quarton who was a close friend of the late Gene Roddenberry. For a short time, he co-starred in Star Trek writer Michael Piller's creation Legend as eccentric scientist Janos Bartok. Following his days on Star Trek, De Lancie also had a recurring role as NID Colonel Frank Simmons on Stargate, SG-1. He has also appeared in Andromeda (another creation of Gene Roddenberry) as Beka Valentine's Uncle Sid, as the angel "Trias" in the video game Planescape. And as pollster "Al Kiefer" on The West Wing. He was also the host of the L.A. Philharmonic Symphonies for Youth for four years where he helped conceptualize student concerts, "Don't Educate – Stimulate." In addition, he's written and directed ten Symphonic Plays: these ninety-minute programs are fully staged productions with orchestra; titles include Romeo and Juliet, Midsummer Night's Dream (Korngold score), Bourgeois Gentleman, and The Abduction from the Seraglio. He has performed and directed for L.A. Theater Works, the producing arm of KCRW-FM and National Public Radio, where the series, The Play's the Thing, originates. He was also the writer/director/host of First Nights, an adult concert series at Disney Hall with the LA Philharmonic which explored the life and music of Stravinsky, Beethoven, Mahler, Schumann, and Prokofiev. These were fully integrated, fully staged productions. In the spring 2004, he gave pre-concert lectures where the symphony is held in Pasadena, California at the Pasadena Civic Auditorium. In 2006 he made his opera directorial debut with The Atlanta Opera performing Puccini's Tosca. He also makes frequent appearances to the Pasadena Symphony, which holds orchestrated music in the fall and the spring. De Lancie was a spokesperson for Compaq computers and formed "Alien Voices" in 1996 with Leonard Nimoy and writer-producer Nat Segaloff. "Alien Voices" does audio remakes of classic science fiction and fantasy stories including The Time Machine, The Lost World, etc. In addition to his acting career, he hosts the children's series of the Los Angeles Philharmonic. 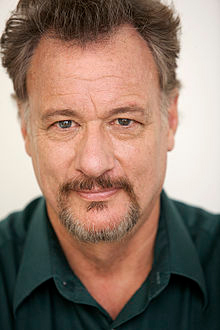 Mr. De Lancie is married to Marne Mosiman and has two sons, Keegan and Owen.